Licence of National Tourism Organisation: MHTE 1174K91001048301. Beautiful villa (120 m2) built in the typical style of the Cyclades, with included Internet Access (Wi-Fi), located near Mikri Vigla, one of the top locations in Naxos, not far from the stretched out beaches of Plaka & Parthenos. Right in front of the house are several small, idyllic coves. Naxos Beachvilla is the corner house of 4 holiday villas, situated on a plot of 1400 m2 private land. - Upper floor: 1 double bedroom with air condition and large terrace / 1 small bathroom with shower and toilet. - free Internet access with Wi-Fi. Additional information: Naxos Beachvilla is the corner house of 4 holiday villas. Between the newly created garden and the small bathing coves runs an unpaved coastal road. Various well-stocked shops can be found within walking distance in the hamlet of Mikri Vigla and in the neighbouring villages (Vivlos, Glinado, etc.) as well as a range of traditional Greek taverns. Car rental is recommended. By car Naxos town or the airport of Naxos can be reached in about 15 minutes. The olive groves covered Tragéa plateau is an ideal place for hiking. The Zas Mountain with 1001 m is the highest mountain in the Cyclades, a wild limestone massif. Hikers find many interesting paths to discover the island on foot, worthwhile in spring and autumn; particularly during the spring season (mid April to mid May) when the island is covered with flowers. For mountain bikers the island offers many donkey paths and unpaved roads. Exteriors: The outside terraces are an ideal spot for your meals, to relax, sunbathing and to enjoy the panorama. Stone benches and flower bowls are built in the terrace balustrade. The landscaped large garden with small marble pebbles is sloping gently towards the sea and gives the house and grounds certain spaciousness. The small herb garden in front of the kitchen terrace leaves the air aromatic and ads a Mediterranean touch to the dishes. To reach the small bathing coves in front of the house, you only have to pass through the garden and cross the unpaved coastal road. The roof terrace offers from sunrise to sunset uninterrupted panoramic views over the bay. the entire length of Plaka beach, the agricultural area and the nearby island of Paros. Built-in stone benches and wooden chairs invite to stay for a while. Unobstructed view on the sea. Wonderful beaches close to the house. Ideally located, only 15 minutes from the main town Chora Naxos. Various tavernas and shopping facilities in the vicinity. Naxos is different from neighboring islands in the way of its multi-facceted landscape with mountains, valleys and rivers as well as sand dunes and beaches surrounded by cedar trees. Location and views, particularly fantastic sea views. Large mediterranean styled landscaped garden. Various sunny and shady seating areas around the house and garden. Very well and comfortably equipped house. Sommer kitchen with BBQ, Large outside shower. On the upper floor there is a small bathroom with shower and toilet. On the lower floor there is a bathroom with bathtub and toilet. The washing machine is located in a separate room together with a laundry rack. Moreover there is an exterior shower with hot and warm water. Hot water all the time. The water supply is guaranteed thanks to an additional water tank. The lliving room is equiped with the typical built-in sofas, a fireplace, Sat.-TV, HiFi system, air-condition and a ceiling fan. Moreover. books and travel guides in various languages are available. Small fridge in the kitchen. In addition a large fridge/freezer on the lower floor. Glass-ceramic hob with 4 cooking zones. Good selection of crockery available. Extendable table in the dining area for up to 8 persons Exterior area with various tables for up to 10 persons. A good choice of various books in different languges is available. The villa built over 3 levels (plus roof terrace) offers 120 m2 space and free Wi-Fi internet access. An open fireplace, tasteful interiors and marble floors throughout give the house a comfortable atmosphere and feeling. Moreover, all windows are fitted with mosquito nets, which offer comfort especially during the summer months. The kitchen is fully equipped (dishwasher, fridge, ceramic hob, oven, extractor hood), toaster, coffee maker, kettle and all other necessary appliances. The living/dining room has an open fireplace, typical Greek built-in sofas, TV and HiFi system & an extendable dining table, air condition and a ceiling fan. Furthermore, guests can use the many books in English and German. The kitchen and living room both open out to the terrace in front of the house and have stunning views over the sea. The terrace has 2 large, extendable tables with chairs and parasol. We highly recommend Naxos Dreamvilla. It was a beautiful place to stay. The villa itself is stylish and well-decorated, with numerous terraces on which to sit and look out at the stunning sea-views. The house is fabulous - spacious, clean and well-equipped. 60 metres away lies a gorgeous cove which was, at times, like having our own private beach. The gardens surrounding the house are delightful too. A fantastic place to stay. Owners and caretakers couldn't have been more helpful. Can't wait to go back! This was our first time to Naxos and we LOVED it. Not only because of the island itself, but because of our 'home away from home'. The Beachvilla is the perfect place to spend your holidays in Naxos. The town is only a few kilometres away (you do need a car) and the house is a gem. The bedrooms are spacious and the living quarters lovely . As the weather was beautiful, we spent most of our time outside in the beautiful garden. The summer kitchen was just perfect and the best was the outdoor shower :). Paola was looking after us and she could not have been more helpful and nicer. We can only recommend the Beachvilla ... great location, beautiful house and stunning surroundings. Just remembering our time there watching the incredible sunsets from the roof top ... a lovely glass of wine ... what more can one want :). We sure hope to be back sometime soon .... Thanks Valerio and Paola!! This is a stunning family house which is even better than advertised. The house is more spacious than we expected and excellently laid out. The views of the sea from the patios and terraces are fabulous. We loved the warm water out door shower - perfect for keeping sand out of the house. It was lovely to be able to walk to the local beach literally over the road and with good sand and warm waters. The house is 15-20 mins drive from Naxos town so far enough to feel that we were in a quiet backwater but close enough to enjoy the amenities of the town. The owner Valerio was very attentive and Paola, who showed us around the house was also great, giving us lots of information and tips. I recommend that you try all the restaurants she recommends! We were an extended family ages 7 - 53 and we all fell in love with both this house and Naxos. We would love to come to stay again. We have visited the island of Naxos many times and have also rented various houses there. For our last two visits, we rented this villa in Orkos and we will never consider another property as we have truly experienced the perfect place. First of all, one experiences the very friendly contact with the Swiss owner who goes out of his way to fulfill all the wishes of his guests. In Naxos we even received a long-distance call from Switzerland, enquiring whether the property met all our expectations as well as a hand-written welcome letter. When we stepped inside the villa, we were struck by how clean it was. The person looking after the property was extraordinarily friendly and gave us many worthwhile tips even for experienced Naxos fans. When we had a problem with the electricity supply one day, someone came to fix it within half an hour. We always had the feeling of being very well looked after. The villa itself definitely exceeds the usual standard in holiday homes. Marble tiles are to be found throughout the house, the furniture is of high quality and various loving touches by the owner show that he has invested his heart and soul in the property. By Greek standards, the kitchen with its Miele appliances makes one want to get stuck into some cooking. There is also a professional grill in the garden. The garden is enormous and our two boys spent hours playing there and observing lizards. Outside seating areas are to be found in every corner, making it possible to enjoy an aperitive in a different spot every evening of the week. The position of the house is breathtaking. A sandy track which is hardly used leads from the end of the garden down to the kilometre-long beach. The fine-grained sandy beach and the crystal-clear turquoise seawater remind one of the Caribbean. It is an absolute dream! In addition, the nearest concentration of tourists is far away on account of the spread-out nature of building on Orkos. Shopping is also very easy. One can get from the property to the nearest supermarket by car in just 3 minutes. The supermarket is well-stocked with fresh food and is supplied by a local bakery every morning. All in all, this was a 5-star holiday. If it were possible we would gladly give this place 6 stars. We really enjoyed our stay in this perfectly equipped house in Orkos. We were a group of six people and there was enough space for all of us.. The house offers multiple terraces with great views and a lot of outdoor space. The outdoor shower is fantastic and extremely practical. There is a big professional grill that was perfectly well kept and super clean. What we really appreciated was the laundry and storage room with a washing mashine and all cleaning utensils which has an extra entrance. The indoor kitchen is a bit small but very well equipped. There is an additional big fridge on the lower floor which is very useful. The nice garden in front of the house and its dense vegetation towards the road keeps the noise and dust from the road from coming in the property. The bay of Mikriviglia, a surfer's paradise is less than 200 m away. The caretaker Paola was extremely nice and easy going. Her restaurant tips were great and very useful. We thank the owner Valerio and Paola for their hospitality and efforts for letting us feel comfortable and we would definitely come back. We spent two full weeks with some friends. We were 8 : 4 adults and 4 small children. We enjoyed very much staying at Valerio's house. Everything is thought to have a relaxing, cosy and happy stay. Nothing is missing. The house is very well equipped and 2 minutes on foot from a peaceful beach. Very easy with small children. The outside shower when coming back from beach is just wonderful. The scenery and view of the sea from the terrasse is just wonderful. We also had the Chance o meet the owner Valerio who is a very welcoming and interesting man . The island of Naxos lies in the heart of the Cyclades and can be reached from Athens by plane (2 to 3 flights per day) or by ferry within 4 to 5 hours. Daily boat connections to many islands like Paros, Myconos, Santorini etc. Long beaches, green valleys and fresh springs characterize the countryside of Naxos. No other Cycladic island offers such varied landscapes – fertile plains, lofty mountains, silver green olive groves, miles and miles of sandy white beaches, which amongst the most beautiful beaches in Greece. Charming picturesque villages, Byzantine churches and medieval towers are scattered all over the island. Naxos-town (Chora) is a lively seaport with a beautiful promenade and a charming old town's maze of small streets. 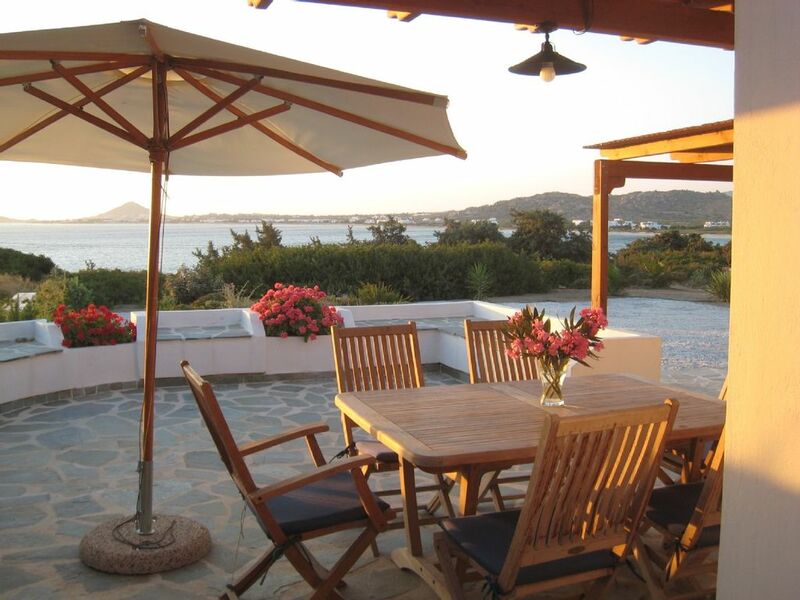 The villa is located on the western part of the island with view towards Paros. Various well-stocked shops can be found within walking distance, as well as taverns and restaurants. Naxos is an excellent destination for hikers in spring and autumn. Weekly change of linen will be provided for a stay of several weeks. Additional charge per cot 50€, payable locally. Car rental is essential. Meet and Greet at port / airport of Naxos, accompany to the house and takeover of house 150€, payable locally. Wöchentlicher Wechsel der Wäsche bei mehrwöchigem Aufenthalt. Zusatzkosten pro Babybett 50€, zahlbar vor Ort. Ein Mietauto wird empfohlen. Abholung am Flughafen /Hafen von Naxos, Begleitung zum Haus und Hausübergabe 150€, zahlbar vor Ort.